Bullitt Group has agreed a two-year title sponsorship deal with the GC32 Racing Tour. In 2015, the circuit for the GC32 one-design foiling catamarans will visit five venues across Europe – Lake Traunsee, Austria; Cowes, UK (including the JPMorgan Asset Management Round the Island Race); Kiel, Germany; Rome Fiumicino, Italy and concluding at Marseille One Design in France during September. Already signed on for the newly rechristened ‘Bullitt GC32 Racing Tour’ this season are teams from the Netherlands, France and Switzerland, with more due shortly. Among the teams announced to date are Armin Strom Sailing Team of former Olympic Star sailor Flavio Marazzi, Dona Bertarelli and Yann Guichard’s Spindrift racing, GDF Suez of Class40 champion Sebastien Rogues and former Mumm 30 World Champion Erik Maris’ Team ZouLou. The circuit is aimed principally at teams backed by private owners, but the class has a full media, photography and TV crew in place at events to ensure that professional teams gain a good return on investment for their sponsors. 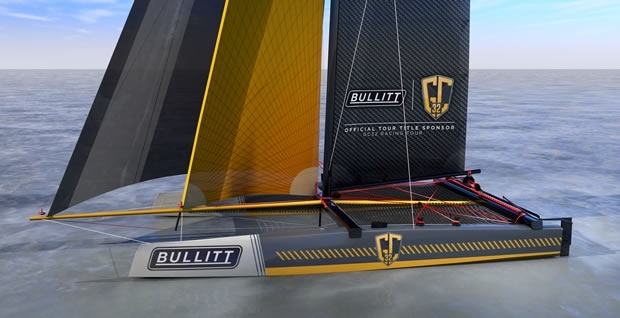 Bullitt Group is no stranger to sailing sponsorship. In July 2014 under its Cat Phones brand, the company announced a Class 40 sponsorship with Conrad Humphreys with the aim of engaging with sailing and outdoor sports enthusiasts via the sport. Prior to Bullitt, both Colin Batt and Dave Floyd - two of Bullitt Group’s three co-founders, with Richard Wharton - were with Motorola, which sponsored Humphreys’ yacht racing campaigns in the Vendée Globe singlehanded handed non-stop round the world race in 2004-5 and the Extreme Sailing Series over 2005-6. Bullitt Group designs, manufactures, markets and sells consumer electronic devices in partnership with global brands. It is the worldwide licensee of Caterpillar Inc. for ‘rugged’ mobile devices and accessories, Kodak for easy-to-use smartphones and connected devices and Ministry of Sound and Ted Baker for audio products. One of the world’s fastest one design sailing boats, the GC32 is able to fly in winds of just 7 knots or more through the use of J-foil daggerboards and T-foil rudders - state-of-the-art yachting technology similar to that used by the foiling AC72 and AC62 catamarans in the America’s Cup. However smaller and a one design, the boat is a fraction of the cost to campaign, simpler to sail for those of average ability and above, and much easier to run logistically. Despite this it is capable of speeds well in excess of 30 knots. Bullitt Group’s sponsorship is a fantastic endorsement of the one-design catamaran class, conceived originally by French businessman, Laurent Lenne and created by Dr Martin Fischer, currently with the design team of Luna Rossa, the Italian challenger for the 35th America’s Cup.